I've been using this Vitamin D for about 5 years now and I would highly recommend it. My doctor sold me some after my Vitamin D levels came back very low. I had already been taking Vitamin D which I bought from the drug store but apparently it wasn't working very well! Within 3 months of taking this one, my D levels were within the optimum range. Now I will never take another brand! 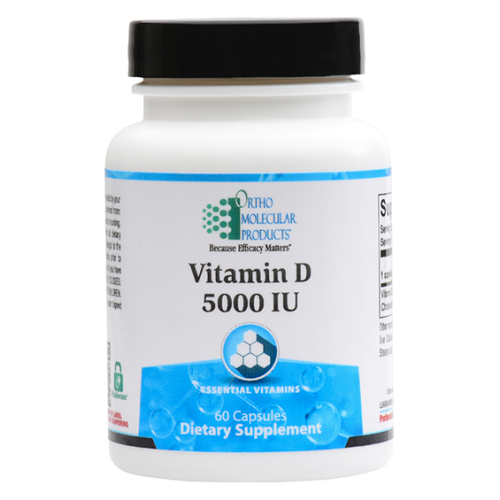 I have been taking Vitamin D, 5000 IU per my doctor for several years now. Thanks to this brand, my levels are where they should be. I highly recommend this product! I've been taking vitamin D for a few years to help with absorption of thyroid medication. Seems to be a very helpful supplement that supports general health as well. This is the brand my doctor recommends, so I'm sticking with it, even though it is more expensive than other brands. I've visited the Ortho Molecular website and have the impression that they are producing high-quality products. Worked so well! Recommend highly!! Able to get off inhalers and worked better than prescription meds I tried. Saved me this allergy season. Vitamin D is most widely known as the sunshine vitamin because the body is able to make vitamin D when exposed to sunlight. Vitamin D plays an important role in supporting bone health, maintaining cardiovascular function and immune function, and promoting an overall sense of well-being. Vitamin D is available in two different forms, D2 and D3. Vitamin D3 is the preferable form as it has been found to maintain vitamin D levels in the body for a longer period of time when compared to vitamin D2. Vitamin D is a steroid vitamin, a group of fat-soluble prohormones that are best known for the role they play in supporting bone health and aiding in the absorption of calcium and phosphate from the gastrointestinal tract. A growing body of research highlights its important role in supporting other body systems, including cardiovascular and blood sugar balance, musculoskeletal strength and neurological and immune function, enabled by its ability to target over 200 different genes throughout the body. At the same time, deficiency and insufficiency of this important nutrient has reached epidemic proportions around the world, making the achievement of optimal levels extremely important than ever to overall health and wellbeing. Known as the sunshine vitamin, one of the key roles of vitamin D is maintaining serum calcium and phosphorous balance. Our bodies make vitamin D by converting vitamin D2 to D3, or cholecalciferol (the active form) when exposed to sunlight. D3 is also the form which the body derives from dietary cholesterol. When calcium and phosphorus levels dip in the body, parathyroid hormone (PTH) is released to increase vitamin D conversion to the active form. 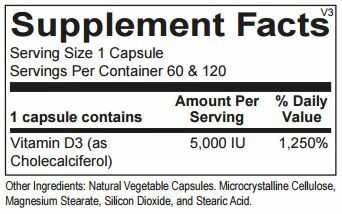 D3 is then metabolized to calcitriol, a steroid hormone that helps regulate a variety of genes through the vitamin D receptor (VDR). While vitamin D is available in both forms as supplements, studies have found vitamin D3 is the preferable form, as it has been found to maintain active vitamin D levels for a longer period of time. 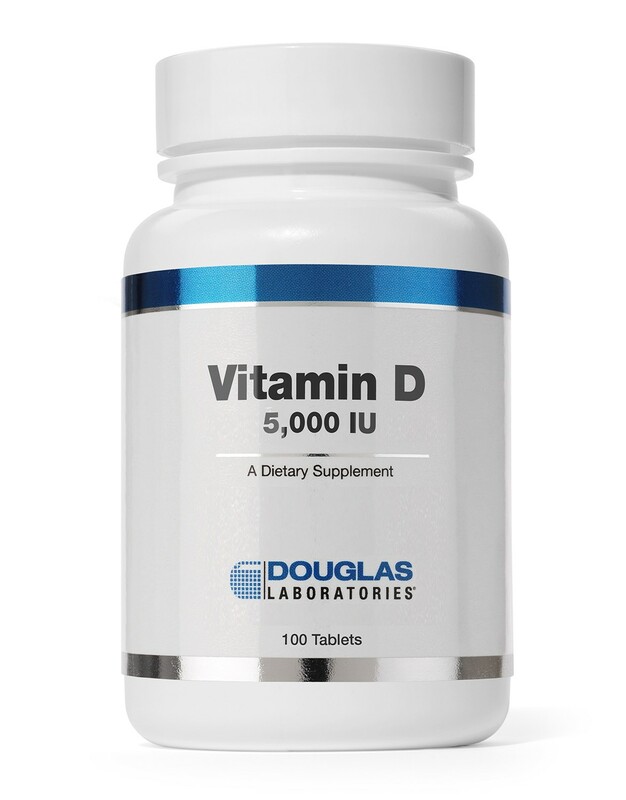 This Vitamin D formulation is delivered as D3 (cholecalciferol) for optimal use by the body and is available in 1,000 and 5,000 IU capsules, to meet a variety of individual needs. 2. Wamberg L, Pedersen SB, Richelsen B, Rejnmark L. The effect of high-dose vitamin d supplementation on calciotropic hormones and bone mineral density in obese subjects with low levels of circulating 25- hydroxyvitamin d: results from a randomized controlled study. Calcif Tissue Int. 2013 Jul;93(1):69-77. 3. Cauley JA, Lacroix AZ, Wu L, Horwitz M, Danielson ME, Bauer DC, Lee JS, Jackson RD, Robbins JA, Wu C, Stanczyk FZ, LeBoff MS, Wactawski-Wende J, Sarto G, Ockene J, Cummings SR. Serum 25-hydroxyvitamin D concentrations and risk for hip fractures. Ann Intern Med. 2008 Aug 19;149(4):242-50. 4. Wang C. J Diabetes Res. Role of vitamin D in cardiometabolic diseases. 2013;2013:243934. Epub 2013 Feb 25. 5. Zittermann A, Koerfer R. Vitamin D in the prevention and treatment of coronary heart disease. Curr Opin Clin Nutr Metab Care. 2008 Nov;11(6):752-7. 6. Oz F, Cizgici AY, Oflaz H, Elitok A, Karaayvaz EB, Mercanoglu F, Bugra Z, Omer B, Adalet K, Oncul A. Impact of vitamin D insufficiency on the epicardial coronary flow velocity and endothelial function. Coron Artery Dis. 2013 May 20. 7. Ng LL, Sandhu JK, Squire IB, Davies JE, Jones DJ. Vitamin D and prognosis in acute myocardial infarction. Int J Cardiol. 2013 Feb 13. 8. Martini, L.A. and Wood, R.J. Vitamin D and blood pressure connection: update on epidemiologic, clinical, and mechanistic evidence. Nutr Rev. 2008; 66(5):291-297. 9. Teegarden D, Donkin SS. Vitamin D: emerging new roles in insulin sensitivity. Nutr Res Rev. 2009 Jun;22(1):82-92. 10. Chiu KC, Chu A, Go VL, Saad MF. Hypovitaminosis D is associated with insulin resistance and beta cell dysfunction. Am J Clin Nutr. 2004 May;79(5):820-5. 11. Hossein-nezhad A, Spira A, Holick MF. Influence of vitamin D status and vitamin D3 supplementation on genome wide expression of white blood cells: a randomized double-blind clinical trial. PLoS One. 2013;8(3):e58725. 12. Cannell JJ, Vieth R, Umhau JC, Holick MF, Grant WB, Madronich S, Garland CF, Giovannucci E. Epidemic influenza and vitamin D. Epidemiol Infect. 2006 Dec;134(6):1129-40. 13. Abbasi M, Hashemipour S, Hajmanuchehri F, Kazemifar AM. Is vitamin D deficiency associated with nonspecific musculoskeletal pain? Glob J Health Sci. 2012 Nov 11;5(1):107-11. 14. Laslett LL, Quinn S, Burgess JR, Parameswaran V, Winzenberg TM, Jones G, Ding C. Moderate vitamin D deficiency is associated with changes in knee and hip pain in older adults: a 5-year longitudinal study. Ann Rheum Dis. 2013 Apr 17.